This spiced salad of raw vegetables is known as Cachumber, Kachumber or Kachmbar in Southern India and Koshumbir or Koshimbir in Western India. These small side dishes of seasoned raw vegetables can be as simple as chopped onion seasoned with lemon and salt or a complex mixture of many vegetables and fried spices. This one is on the more complex end of the spectrum and is really delicious, it adds a lovely crunch to any meal. Choose your own variety of vegetables, whatever is in season, and feel free to experiment with other spices. Finely chop the vegetables, for this recipe i usually do about 2-3 heaped tablespoons of each vegetable, aiming for about 2-3 cups of vegetables altogether. Heat 1 tbsp of oil and when hot add the mustard and cumin seed then add the coconut. Stir and lift off the heat as soon as the mustard seeds crackle and the aroma from the coconut rises. Stir the fried spices into the freshly chopped vegetables add the juice of half a lemon or more and salt to taste. Leave for 1 hour before serving so that the flavours and juices of the vegetables mingle. Serve with a little extra coconut sprinkled on top. Variation freshly grated coconut would be great but as i cannot grow it here i keep some bought unsweetened descicated in the pantry. 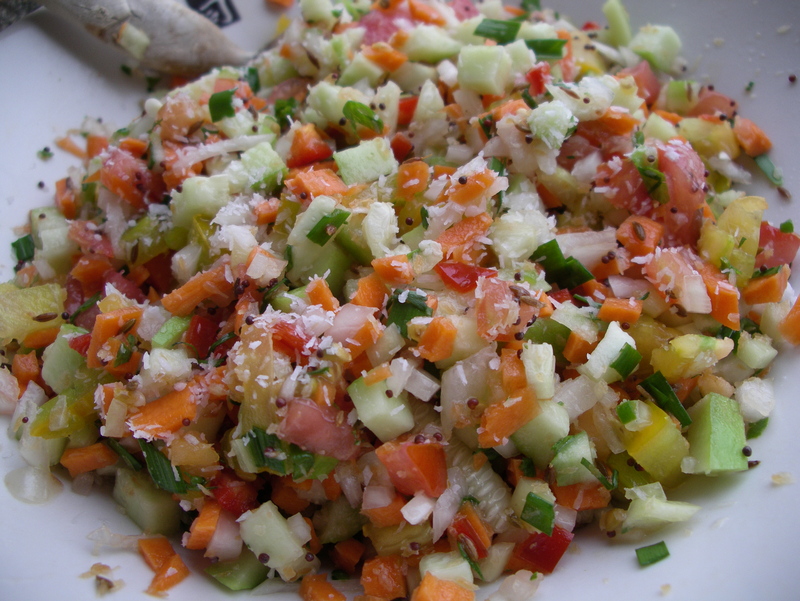 This raw salad type relish has bags of flavour and a lovely fresh zing to it. Sweet white onions are simply seasoned with salt, lemon and mint and the result is a delicious fresh side salad or relish to go with grilled foods, lentil or rice dishes. Mince the onion finely. Sprinkle with salt and lemon juice. 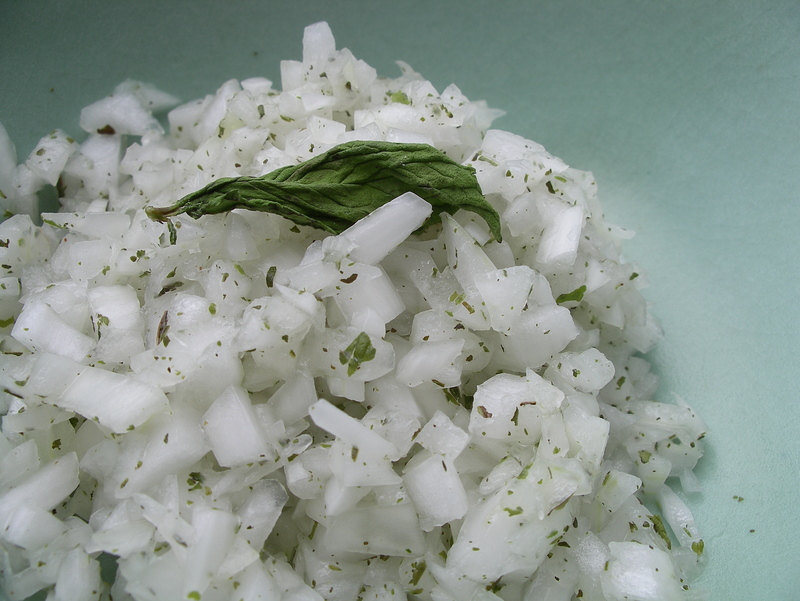 Rub the dried mint between the palms to break it down to a fine powder and sprinkle over the onions. That is it done, stir and serve. The salad can be left for an hour or so before serving and is still good 24 hours later so it can be made in advance. Note In this part of France we a re lucky that it is an area famous for its sweet onions including the Cevennes Doux. A sweet Spanish or salad onion would make a good substitute. In most cases I would choose fresh herbs rather than dried but for this relish dried really does work best. Garden Tip If you grow mint it is best to cut it back once or twice during the year, particularly as the weather gets hotter, to encourage fresh new growth. I grow a lot of mint so the twice annual cut backs provide plenty of mint to use fresh and to dry. 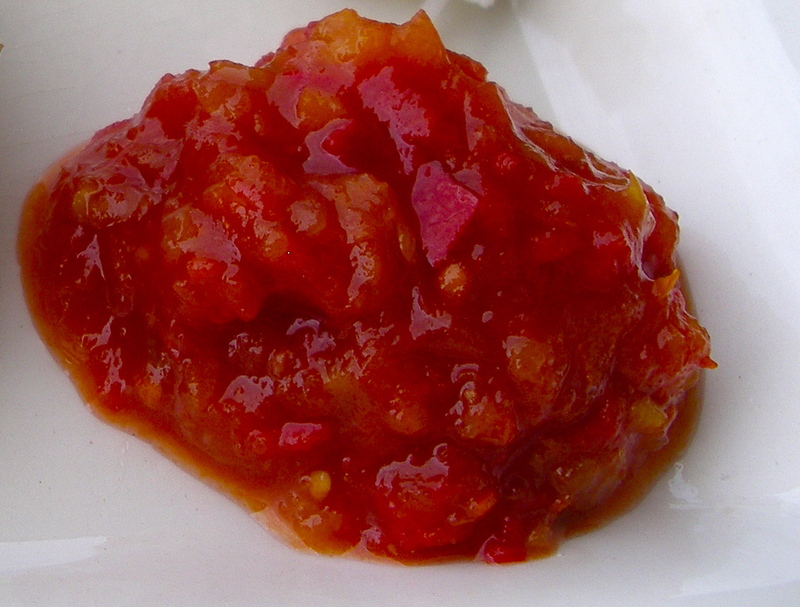 This is a simple tomato chutney or Tamatar Chatni made with fresh tomatoes and a light Indian spicing. The flavour is delicate, sweet with only a hint of heat. It goes wonderfully with all kinds of dishes. Roughly chop the tomatoes discarding the cores. Heat the oil in a saucepan and when it is hot put in the chilli, cumin and cinamon and fry until the chillis start to turn brown. Add tomatoes sugar and salt and cook for about 15 minutes until the tomatoes are cooked down and the chutney is fairly thick. This chutney is ready to serve immediately, it is not a preserve but it does last for a couple of weeks in the fridge. Source The original recipe came from The Art of Indian Vegetarian Cooking by Yamuna Devi. Note the original recipe cooked the tomatoes in ghee but I prefer to use sunflower or vegetable oil and I also added more dried red chilli but that really is up to your taste buds it is also nice to add fresh green chillis thinly sliced green chillis for extra punch. If you have never tried tamarind chutney before give it a go; it is a quick with no cooking involved and absolutely delicious. If you can get your hands on fresh Tamarind pods by all means use those otherwise tamarind can be bought in blocks shelled and compressed. Soak the tamarind block in the hot water for 20 to 30 minutes. Push it through a sieve along with the soaking liquid, make a few passes to get a thick puree. Stir all the remaining ingredients into the tamarind puree, taste and adjust the quantities to get a good balance. As simple as that. It will keep for 2 months in the fridge. VariationI also make a version of this with black plum puree instead of tamarind which is really delicious. This Indian raita comes from Madhur Jaffrey who has several versions of a yogurt and walnut relish. In her book Madhur Jaffry’s Indian Cookery 1982, Kheere ka raita includes yogurt, chilli, salt, walnuts, green coriander, green chilli, spring onion and black pepper while the Kashmiri version in A Taste of India 1985 has simply yogurt, chilli, salt and walnuts. This version is based on the kashmiri recipe but with the addition of coriander and green chilli. Bash the shelled walnuts with the coarse salt then stir into yogurt add sliced green chillis and ground dried chillis to taste add coriander stir well and serve. Freshly made pickles or achars are a speciality of India and one of my favourite ways of eating raw veg, more of a side salad than a pickle, they are meant to be eaten fresh rather than stored. 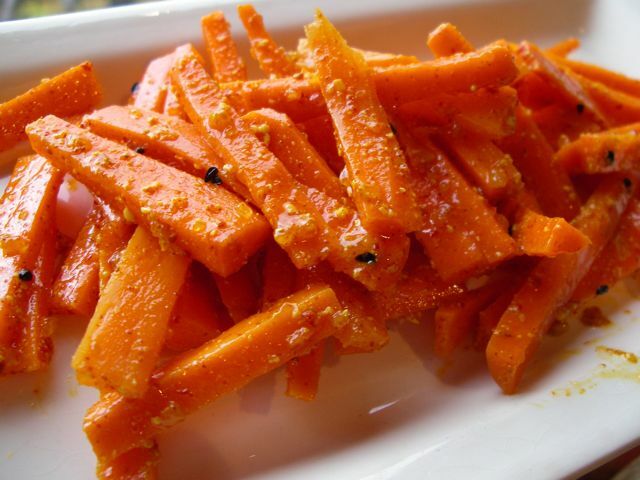 For this one the raw vegetables are simply tossed in spices and hot oil which transforms the humble carrot into mouth tingling morsel of yumminess that peps up all kinds of food. This one is particularly quick, requiring no standing time at all, and is hot, pungent and delicious. It really brings out the sweet crispness of the raw carrots and is wonderful with rice and a simple dal. You could also add it to a cottage cheese wrap, scatter over a leafy salad or just tuck into a bowlfull of this as a snack. Peel and cut the carrots into small batons about two inches long. Crush the whole spices, a coffee grinder works perfectly or just bash them up in a mortar, add the other spices, sprinkle over the carrots and toss well. Heat the mustard oil in a small pan until it starts to smoke, this mellows the oil, then pour the hot oil over the carrots and toss to make sure all the carrots are coated in the oily spice paste. Serve immediately or it will keep for a few days in the fridge. Recipe Source I am not clever enough to invent this stuff, this recipe came from Tarla Dalal’s fantastic book Achaar aur Parathe. I have kept to her recipe but reduced the spicing a little bit. This is a classic side salad. A refreshingly tangy salad of tomatoes, onions and cucumber straight from the garden with a hint of chilli and lemon which gives it the piquancy. Salads like this are found all around India, the mediteranean and middle east. It makes an excellent summer side salad and goes well with grilled meats and curries. Optional herbs; flat leaf parsley, mint or coriander finely chopped. Finely chop the onion, tomato and cucumber, add the citrus juice, season with salt, pepper, sugar and chilli to taste and give it a good mix. Serve immediately sprinkled with herbs. This is not so much a recipe as a reminder to make something fresh to accompany a meal. We eat this stuff with everything, it is so simple and yet so tasty. 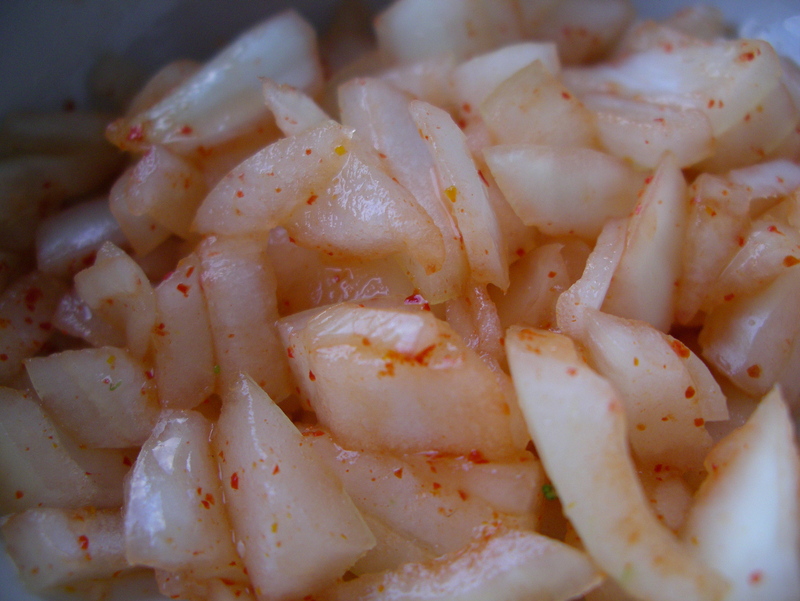 Raw onions chopped and seasoned with home-made chilli powder, salt and a squeeze of lemon or lime. 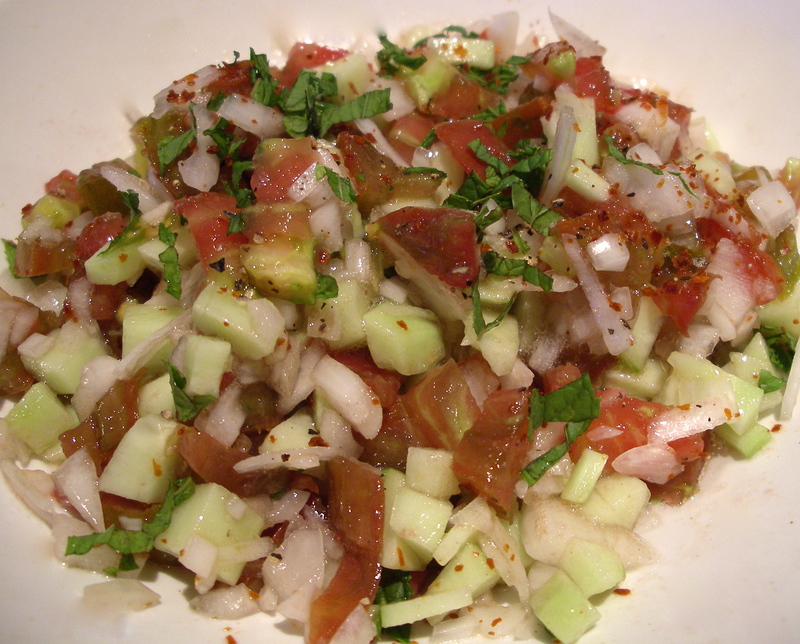 You can make it as hot as you like and it is a wonderful little fresh relish or kachumber to give an accent to any meal. I especially like it with Indian dishes, barbecues, and on picnics. Variations add fresh herbs such as mint or coriander, grated coconut, fried spices or yogurt to make a side with more complex flavours.